Thank you for your interest in wellness coach training and learning more about becoming a Certified Wellness Coach (CWC). You can schedule a free consultation by filling in the form below, or you can email or call us to talk you through how our CWC programs might fit into your career path. Form a Clear Vision - Many very gifted independent wellness coaches fall short of their goals for client growth and business development primarily because they do not create a clear vision. This can encompass a number of areas, but must include audience and credibility. Laser Focus and Persistence - A hodgepodge approach to marketing never provides the opportunity for your business to take hold. Instead, become very clear about your target audience. This doesn't mean you can't expand beyond this initial group over time. However, begin with a specific audience in the forefront and put systems in place (see #2) to pursue this group consistently and with focus. Then, once you've identified that audience, remain persistent in your outreach. Target Audience - if you decide to pursue individual clients rather than organizations, what will be the focus area for these individuals? Are they seeking to manage their weight? Prepare for their first triathlon? Create enhanced life balance? Improve their overall health status? Your answer will guide where you spend your time and resources. Repeat and then do it again - regardless of your intended audience, realize that "no" (or no response) actually means "not today" rather than "not ever." If you stay the course, the decision by either an individual or an organization to utilize your services may take months or even years to come to fruition. Just as improving our own health and wellness takes time, so too does building a business. Your credentials - your certification as a Certified Wellness Coach or your degree in Nutrition or another wellness-related field will carry a great deal of weight initially. Anyone "can" hold themselves out as a wellness coach. Do you have an outside, accredited agency saying you know what you're talking about? Your email address - you read that correctly. Something as simple as your email address can be the difference between earning a client and (accidentally) announcing to the world that you're only doing this as a hobby. If you're still using an @gmail.com, @yahoo.com or similar type of email address, it's time for a change. Your web portal (including your Health Risk Assessment) - this should go without saying, but it's something we see over and over. Struggling coaches think they're saving money by sending clients to generic, outside websites and skipping the Health Risk Assessment (HRA) process. Unfortunately, all they're really doing is trapping themselves into the low end of the wellness universe, with essentially no chance of growing beyond the start-up phase. If done correctly, a coach can access both a professional portal and HRA for just a few dollars/month/client, while increasing the perceived value on the part of the client immensely. Beyond the HRA, some other valuable components to seek out in your web portal might include goal setting tools, library of resources, individual and team contests/challenges, BMI, fitness and nutrition trackers. Systematize - As a small business owner, you'll be pulled in many different directions on a daily (hourly) basis. It's easy to turn around and realize that you've forgotten to update your database of contacts, send out your newsletter or follow-up with interested individuals in a timely manner for several days or even weeks. By systematizing every possible process, you'll not only simultaneously simplify your life and enhance your business outcomes, but you'll also be prepared to delegate that specific aspect to a future employee as your business grows. Discussion Tracker - The ACT! Database (see www.ACT.com) is a popular tool and the one we use internally, but again is one of many options that will allow you to track your discussions and interactions with clients and potential clients. However, it's not an option to skip this area. Financials - regular review of accounts payable/ accounts receivable/ expense trending isn't an "extra." More small businesses close down due to cash flow issues than revenue issues. Stay on top of this from the beginning. A good place to start might be www.quickbooks.com, which offers a relatively simple software solution. Sales Strategy - rather than "shooting from the hip" with a different sales or marketing strategy on a weekly or monthly basis, instead identify a strategy and make it (and the tracking of its results) part of your weekly pursuits. Please complete the following form to access the rest of the report. This complimentary resource was designed as a starting point for those wellness coaches desiring to integrate credible wellness coaching into a clinical or related setting. It is not intended to be comprehensive, but will provide the user with much of what will be needed to submit a proposal to a potential partner in this area. Thank you for your interest. The report is complimentary and is available to you immediately upon completion of the brief items below. Please don't hesitate to contact us with any questions you may have. The following was designed to provide a starting point for those desiring to integrate credible wellness coaching into their Physical Therapy practice. Be sure to review any legal or licensure requirements, as those are not addressed within this document. It is not intended to be comprehensive, but will provide the user with much of what will be needed to either submit a proposal to a supervisor or appropriately plan for direct integration. Abstract/Summary: The integration of wellness into our practice provides an opportunity to enhance our results, relevance and revenue simultaneously with a minimal investment of both time and resources. Defining Wellness Integration in Our Context: Physical Therapists and PT Assistants have always incorporated wellness into our practices. At the core, we are wellness providers. The concept here is to expand beyond standard Physical Therapy treatment or the common inclusion of providing classes for or opening up our facilities to the general public. Rather, this will integrate wellness coaching in and around our practice, addressing the wide range of needs among our patients and in our communities in areas ranging from nutrition and weight management to life balance, stress management and more. Background Information of Note: The American Physical Therapy Association has highlighted the value of the integration of wellness into our practices on several fronts, including a national task force, various articles within the Association’s PT in Motion periodical, and as the featured topic of discussion at the National Conference Oxford Debate in 2013. With current tools and resources available, a program can be effectively launched in less than 6 months at an estimated investment of under $3,000 with staff we currently have in place. This will allow us to enhance the outcomes and overall experience of our current patients, expand our pipeline for future patients, further build our reputation with referral sources, employers and the community, and provide a potential additional revenue stream for our organization. Example provided in webinar discussed the significant increase in spine referrals that resulted from launch of a specialty Pilates program, including several PTs earning certification as a Pilates Specialist. This was not direct “Pilates” revenue but had a very significant impact on the facility’s bottom line. Similarly, referral sources are seeking providers who can meet the needs of their patients who have notable health and wellness issues beyond the specifics of the referring diagnosis. By developing a credible wellness program under our same roof, the benefits beyond direct “wellness” revenue may prove to be significant. Direct Revenue (for individual coaching on a cash-paying basis) - Based on variable costs of $49/month + $5/client/month for Coach and Client web portal tools and resources. Salary costs not built into these examples due to ability to schedule around standard clinic downtime (ie, utilizing lighter times in facility such as Tuesday mornings to provide wellness coaching) but could be added here. Note- these estimates simply showing conservative direct revenue without considering the (possibly more valuable) benefits noted above. Abstract: The immense participation growth in the pursuit of endurance sports across the globe has resulted in a concurrent growth in opportunities for talented and knowledgeable coaches. Triathlon, cycling, running, swimming, mental, nutritional and other coaches are coming alongside these individuals and helping them to more effectively reach their goals, and do so in a shorter timeframe. However, as the field continues to grow, it is critical for any coach who is planning a long-term career in this industry to differentiate from the competition. This document identifies how the integration of quality wellness coaching can enhance the overall skills/value of the coach while simultaneously bolstering the current and future growth of the business. Participation in endurance sports over the past two decades has exceeded even the most generous of expectations. According to RunningUSA.org, road race finishers totaled five (5) million people in 1990 and grew more than three-fold to over 15.5 million by 2012. Marathon finishers more than doubled from 224,000 in 1990 to 518,000 in 2011. The half marathon grew from 303,000 to a record number 1,850,000 in 2012 during that same time period. Triathlon participation has followed a similar growth trend. There are now an estimated 4.4 million people worldwide who compete in triathlons. USA Triathlon reports in their annual review of demographics that membership has grown from 6,700 in 1987 to 550,446 in 2012 (this second figure includes daily memberships). There are now over 3,000 events sanctioned by USA Triathlon on an annual basis. At the far end of the bell curve, RunTri.com reports that over 41,000 people finished an Ironman triathlon in 2012. This event began in 1978 and had a total of 12 people finish the race that first year. As more and more people began making endurance athletic events a core part of their lives, they looked for ways to do so more successfully and with a shorter learning curve. A variety of individuals stepped in to fill this gap. Originally, "coaches" may have been friends or training partners who were a little faster. Experts then came to the forefront from a variety of different backgrounds (former professionals, passionate and knowledgeable amateur athletes, teachers and others) entered the profession. Soon after, a variety of certifications such as the USA Triathlon Coaching Certification were made available to both expand the knowledge of coaches and enhance their credibility with clients and potential clients. There is no accurate way to estimate the number of part and full-time endurance coaches, but there is no doubt this figure has grown at least as rapidly as the participation trends noted above. Number of clients: While the total number of individuals participating in endurance pursuits continues to grow, the number of people at the tip of the bell curve who require coaching beyond what is provided in a book or magazine training schedule is finite. As more and more coaches enter the marketplace, these potential clients will be spread across a larger number of coaches. This will be combined with the entry of technology into the industry, which will allow individuals to enter specific details about themselves, their results and their goals and receive computer-generated plans. While it is clear this is a very different experience than a personal coach, it never-the-less will impact the business of independent coaches. The combination of these two growing trends will be a decrease in the total number of clients pursuing personalized coaching, and a drop in overall business for the majority of coaches. Revenue: The reduction in total number of clients will have an obvious impact on revenue. Unfortunately, it will not be the only component to have a negative impact on coach revenue. Rather, the growth of coaches on the supply side will also impact the ability to charge the same rates as in the past due to increased competition and available alternatives. As a result, monthly or annual revenue per client will be reduced over time. Commoditization is the process by which something becomes a "commodity" and is seen as essentially the same as anything else with the same name. Beans, rice, grains are all commodities, and as such they all sell for whatever the going (lowest possible) rate is for that item. The price for commodities is driven directly by one simple equation – supply and demand. In every business, there is one primary route to (at least in part) avoid the impact of supply and demand. That route is differentiation. For example, some farmers who were previously offering a standard commodity in their crops have begun differentiating themselves through the growing of organic products. This process clearly involves more by the farmer (investment, time, etc) on the front end, but may provide a higher return over the long term. Tom Peters, in his book The Circle of Innovation, quoted management consultant James Morse: "The only sustainable competitive advantage comes from out-innovating the competition." While an endurance coach may hesitate to identify other coaches as competition, it's a fact of life. The key to remaining at the top (in terms of both the consistent demand for your services over time and the value those services are seen to have in the coaching marketplace) is innovation – or differentiation. Wellness is a natural extension to the business of endurance performance coaching. It is likely the simplest, yet most valuable way in which to differentiate both you personally as a coach and the coaching services offered by your organization in order to build your current and future coaching business. Wellness coaching is one of the fastest growing professions in the country (for more details about earning a CWC as a Certified Wellness Coach, see www.CatalystCoachingInstitute.com). It is being offered to employees in companies large and small, supplementing the skills of personal trainers at recreation centers and fitness clubs nationwide, and gaining a valued foothold among retirees and baby boomers who desire to optimize their health and activity levels. How is wellness coaching different from the coaching you're currently providing? While there is an overlap of the skills utilized, wellness coaching tends to focus more on "big picture" wellness rather than event-specific fitness pursuits. This big picture may include but not be limited to stress management, nutrition, sleep enhancement, weight management, and other aspects more general to health and wellness. Wellness coaching will involve the utilization of areas such as Motivational Interviewing, Temperament recognition and Intrinsic Motivation, skills that can also be effectively utilized with endurance and performance coaching, but typically aren't part of the standard coaching toolbox. Each of these will be expanded upon individually in the following sections. Wellness Coaches come from a variety of backgrounds and look to work in a wide range of professional settings, from running their own business to working for another organization. While the specifics that make up each of these unique settings vary, there are a number of critical components every current (or even future) Wellness Coach must know and understand. This special report provides a baseline of those aspects. Details include everything from the upcoming NCCHWC national wellness coach exam to how to effectively grow your business and much more. This is one of our most popular complimentary downloads, for good reason. The Personal Training industry is on the rise. As more and more individuals adopt healthier lifestyles, there is a growing need for credible and effective Personal Trainers. However, as the field continues to grow, it is critical for any Personal Trainer planning a long-term career to differentiate from the competition. 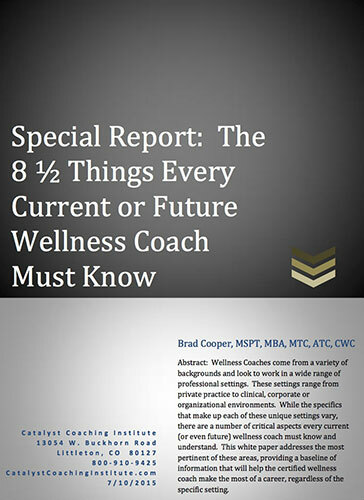 This document identifies how the integration of quality Wellness Coaching can enhance the overall skills/value of the Personal Trainer, and thus positively impact the overall earning potential.